It was hard for me to decide who gets top billing today, since bbdb was the title I was chasing, but I didn’t get too far without charrington. On the other hand, charrington isn’t specific to bbdb, even if it did make bbdb a lot more useful. I should explain. 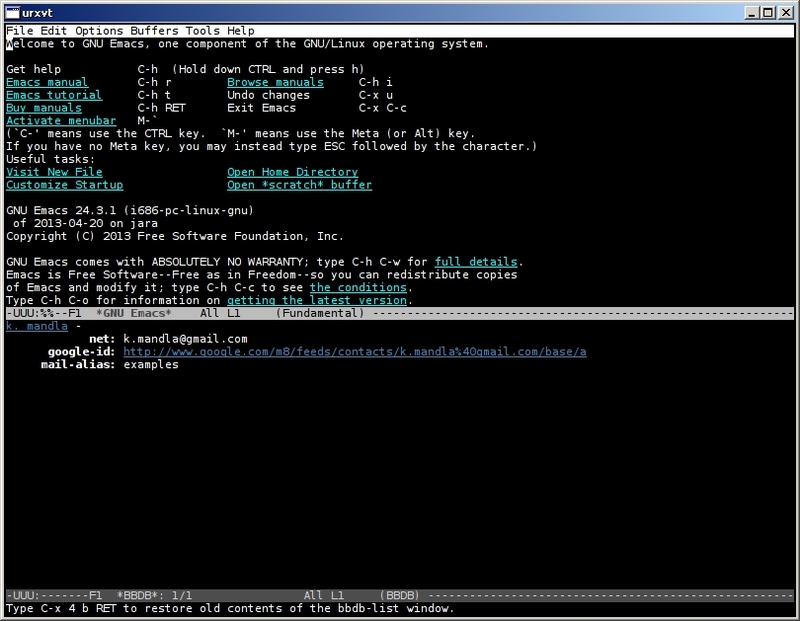 bbdb is a rolodex-ish address book utility for emacs. I understand it has a 13-year history and has quite a few provisions for specific address details. It installed fine, required only two lines in my .emacs file and seemed to be working fine with M-x bbdb. Unfortunately, I had no addresses in my .bbdb file, so as you can imagine, I didn’t get far. Enter charrington, which extracts contact information from a GMail account (GMail users will probably pay attention now). Ideally it exports to a .bbdb file, but can supposedly handle mutt format too (mutt users will probably pay attention now). charrington took only a few minutes to figure out. It needed python2-gdata from the Arch extra repo, and would run from python2.7 charrington.py. Next, I copied the example charrington.conf file to ~/.charringtonrc, edited it to include my GMail account name (not full address, so just k.mandla, not with the at-gmail-dot-com) and plain-text password. Yes, I know, it’s plain text, but I figure I’ll only use it once or twice. Then I ran charrington again with python2.7 charrington.py -g >> ~/.charringtonrc, to get the URLs for each group of contacts. I edited the .charringtonrc file one more time to make the URL list match the configuration file’s style, and then finally, python2.7 charrington > .bbdb. I’m ashamed to admit that beyond searching and getting back results from bbdb, I don’t have anything to show. If there are ways to add, edit, delete or otherwise wrangle the database, I didn’t look for them, mostly because I spent most of my time wrangling with charrington. This entry was posted in Linux and tagged address, contacts, data, e-mail, import on 2014/08/21 by K.Mandla.